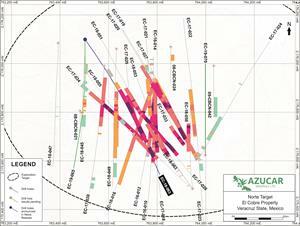 VANCOUVER, British Columbia, March 20, 2019 (GLOBE NEWSWIRE) -- Azucar Minerals Ltd. ("Azucar" or the "Company") (TSX-V: AMZ; OTCQX: AXDDF) is pleased to announce results from its ongoing drilling program at the El Cobre porphyry copper-gold project in Veracruz State, Mexico. 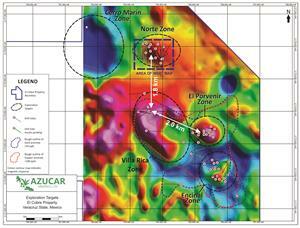 Drilling results reported today come from hole EC-18-063 at the Norte Zone. 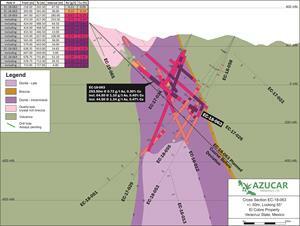 This hole drilled across the system above the late mineral intrusive body and was designed to test for deep high grade mineralisation on the south margin of the porphyry complex.